Jeong Won-hee is giving her valedictorian speech on SNU’s 69th commencement. 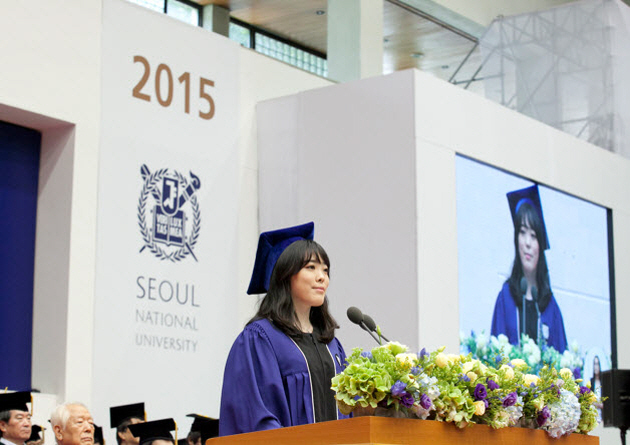 JEONG Won-hee (College of Business Administration) graduated as valedictorian at the recent Seoul National University commencement ceremony held on August 28, 2015. 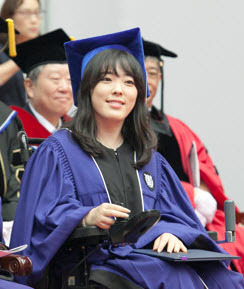 Every year, SNU selects an exemplary student to deliver the valedictory, but JEONG differed from all the previous valedictorians in that she was the first disabled student to represent the entire graduating class. JEONG was diagnosed with cerebral palsy just 11 months after her birth. The disability not only made it difficult for her to move without a wheelchair, but also required her to receive rehabilitation treatment until elementary school. Through rehabilitation, JEONG was able to gain use of her left hand, and started to excel academically throughout middle school and high school. Eventually, she was admitted into SNU College of Business Administration in 2009. After enrolling at SNU however, JEONG had to face even more difficulties due to her physical disability. She says,"I soon realized that SNU had so many outstanding students. I was not confident about doing well among all these people. Also, compared to non-disabled students, I needed to put in more energy and effort just to go to lectures or language institutes. Moving the same distance was simply much more inconvenient for me." During her college life, JEONG encountered much skeptic people who were prejudiced about her abilities, telling her that what she tried to do was not possible. In order to overcome such discouraging remarks, JEONG participated in many extracurricular activities both in and out of school. She contributed to the local community by coordinating various programs for children from multicultural families, as well as volunteering as an assistant teacher at a preparatory school for mentally disabled students. Her appetite for life did not stop there. Although JEONG had to perform most of her daily activities on a wheelchair, she actively participated in ZIT, an institute of culture and arts for the disabled that manages performances and publications regarding disability aesthetics. As a member of ZIT, which consists of both disabled and non-disabled people, JEONG produced and acted in more than ten plays. A major reason for taking part in ZIT was to"demonstrate that the bodies of the disabled were equally beautiful and capable of expressing themselves freely on stage." She also mentioned,"Generally people associate the disabled with inferior or uncomfortable images. Or they think of great names who have successfully defeated their disabilities. But I believed that the disabled are simply normal and ordinary people, and that acting in a play was an effective way to communicate this message to the public." In addition, JEONG also achieved the feat of going on a backpacking trip to Europe by herself on her wheelchair, as well as going to Vienna as an exchange student. The main source of motivation that enabled JEONG to lead such a proactive college life was her firm belief that she could accomplish whatever she dreamed of doing. She never lost the faith in her own potential and convinced herself that she could achieve what others thought would be impossible for her. She emphasized that a wider world opened up when she took complete control over her own life. Her friends also helped her with any difficulties, for example the need to install automatic sliding doors in every building of the College of Business Administration. Recognizing that her accomplishments in the face of adversity met with the university's ideal of embodying originality and contributing to the community, SNU presented JEONG the honor of delivering the valedictory at the commencement ceremony. "I knew that there were many other fellow graduates who have been more outstanding than me," JEONG said. "But I was honored to represent all the graduating students this year, so I tried to convey a message that only I can say in my commencement speech." On the day of the commencement, JEONG told her fellow graduates,"It may feel a bit strange to have a disabled person giving this speech. But because of my physical uniqueness I was able to experience the world from a different perspective, and thus my life became more abundant. There may be times when we face hardship and lose confidence in the belief that we can achieve anything. The media today tell us that there is no hope for us. But during those moments, let us think of all the time we spent together in our alma mater and renew faith in ourselves. Let us become the evidence of hope that lights up today's dark world, by proving impossible things are in fact possible." Already working at Korea Investment Corporation (KIC), JEONG plans to work in the foreign investment sector in the future.